Visiting the dentist is about more than getting clean, shiny teeth. Regular dental visits can help you prevent dental disease and find signs of disease early. This helps you keep your mouth healthy, which can save you both time and money. • Decay caught early can be reversed! • Untreated tooth decay can lead to cavities. • Cavities can cause pain, loss of confidence and tooth loss. 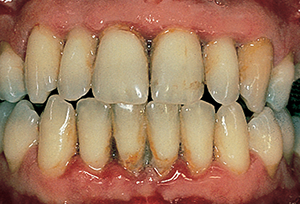 • Treating decay or cavities can prevent them from getting worse. • Periodontal (gum) disease is the main cause of tooth loss. • Sometimes your teeth or gums may not hurt even though you have gum disease. • See your dentist if you notice that your gums are red, swollen or tender or that bleed when you brush or floss. • Another sign of gum disease is bad breath that won't go away. • Treating gum disease early can prevent it from getting worse. • A dental hygienist or your dentist will clean your teeth to remove surface stains and any tartar (hardened plaque) that has formed. • Your dentist and hygienist can give you tips for cleaning your teeth, caring for your gums and improving your breath at home. Professional dental cleanings can also help you prevent gum disease. • Your dentist checks your mouth and neck for signs of cancer every time you visit. • When you have problems with your mouth, it can get in the way of your everyday activities and it may be hard to eat the foods you like. • An early sign of diabetes may be mouth sores, gum disease or other oral problems. Your dentist is trained to notice these signs and can refer you to a doctor if needed. Even if you wear dentures, you still need a regular oral health checkup. Over time, dentures can become loose because of changes in your gums and bones. Your dentist will make sure your gums are healthy, look for signs of cancer and check your dentures for proper fit.